Vascular plants are plants with vascular tissue within roots, stem, and leaves. Xylem and phloem transport water and minerals throughout the plant enabling this group of plants to reach sizes unattainable by nonvascular plants. The form the subkingdom tracheobionta, which has over 40,000 accepted taxa overall. The group includes ferns, conifers, flowering plants, and others. All vascular plants root and shoot systems. The shoots are what we see above the ground, and consist of the leaves, buds, stems, and (if the plant has them) flowers and fruits. A plant grows from it's tip by mitosis (cells duplicating themselves). The root system, what grows below ground, consists of roots, tubers, and rhizomes. The root system has two main purposes: supporting the plant, and absorbing water and minerals from the ground. There are many types of roots such as taproots and fibrous roots. 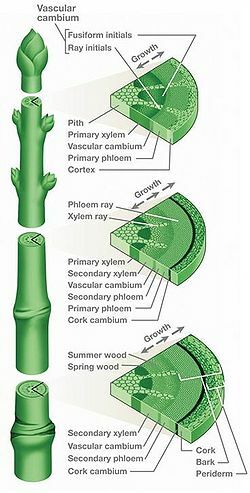 In both the shoot and root system there are two vascular tissues used to transport substances: xylem and phloem. The xylem's function is to transport water and minerals from the roots to the rest of the flower. Whereas the phloem is involved with transporting the products of photosynthesis (glucose) throughout the plant, and to the roots for storage. Xylem is vascular tissue that transports water and dissolved minerals that is taken up by the roots. In angiosperms, most of the water travels in the xylem vessels. These are thick-walled tubes that can extend vertically through several feet of xylem tissue. 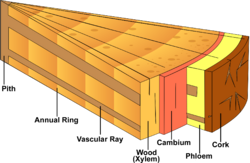 The walls of xylem vessels are thickened with secondary deposits of cellulose and are usually further strengthened by impregnation with lignin. Xylem vessels arise from individual cylindrical cells oriented end to end. At maturity the end walls of these cells dissolve away, and the cytoplasmic contents die. The result is the xylem vessel, a continuous nonliving duct. Phloem contains the products of photosynthesis. The phloem contains two main components: sieve elements, and companion cells. Sieve elements are named this because of their perforated wall ends which allow cytoplasmic connections between vertically stacked cells. This makes a sieve tube which conducts the products of photosynthesis (sugars and amino acids) throughout the plant from the leaves to storage places (roots, fruits, flowers, etc...). Companion cells move the sugars and amino acids into and out of the sieve tubes. They use transmembrane proteins to take sugars and amino acids from their source that produces them and are moved to other sieve tubes with diffusion. Osmosis moves water causing enough pressure to push materials through the sieve tube. Vascular plants with seeds that are not protected are known as gymnosperms. The four main divisions of gymnosperms are: cycadophyta (cycads), Ginkgophyta (ginkgo), gnetophyta (gnetae), and coniferophyta (conifer). Coniferophyta literally means "cone-bearing" because its seeds are cones. 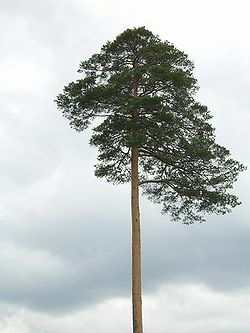 Conifers are sporophytes (produce spores) and produce both male and female cones on its tree. The male cones produce pollen while the female cones produce two or three eggs called ovules. The pollen from the male gets released in the spring and blown in the wind. The female cone will catch the pollen and will find the eggs on the female cone. Methods of reproduction are similar in other gymnosperms but the sperm can also be transported by a water drop, by a bee pollinating and other ways. Vascular plants with seeds that are protected are called angiosperms which are the most complex of vascular plants. Over a quarter of a million species have been identified as angiosperms. Angiosperm means "seed vessel" because the female tissue (endosperm) encloses the seed. During the embryonic stage, the endosperm serves as a source of nourishment. The endosperm may then become a fruit depending on the plant. This is why a seed is often found within a fruit. Angiosperm flowers have a ring of modified leaves called sepals that protect the growing flower bud. Another ring they have are the flower petals which are often colorful and eccentric in order to attract pollinating animals. Flowers have male stamen and female pistils in each one, so as they pollinate the flower, they also get pollen to spread to another plant. Humans would not be able to live without plants just as plants would not be able to live without us. Humans need constant oxygen, and in exchange, give off carbon dioxide. Plants need carbon dioxide, and in return, produces oxygen. A plant also provides food for humans and animals alike and other uses like medicines and spices. Plants need us too just about as much as we need them. Like a bee helps with reproduction of flowers and such, humans also help keep plants in gardens so that they can live on and so we can just see their beauty. A plant obtains food by photosynthesis which is a plant taking light energy and converting it to chemical energy and storing it as sugar. It obtains this by combining the light energy it acquires via its leaves and water from the roots to make sugar. Photosynthesis takes place in the chloroplast using chlorophyll (a green pigment involved in photosynthesis). Chlorophyll looks green because it absorbs red and blue light leaving only green light for our eyes to see. This is because the chloroplast absorbs its energy from the red and blue light; the green light cannot be absorbed so it cannot be used in photosynthesis. The chemical reaction in photosynthesis is 6CO2 + 6H2O (+ light energy) C6H12O6 + 6O2. This page was last modified on 22 November 2012, at 16:49.